The Georgian National Academy of Sciences, successor to the Georgian Academy of Sciences, was established in February 1941. 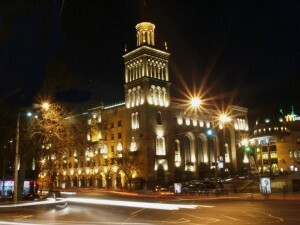 The direct predecessors of the Academy were the Georgian branch of the All-Union Academy of Sciences and the Tbilisi State University, where a number of research institutions and scientific centers were created in the 20s and 30s of the past century. The Georgian National Academy of Sciences coordinates scientific researchers in Georgia and develops relationship with up to 20 Academies of foreign countries and other scientific countries. It is a scientific Adviser to the Georgian Government. The Georgian Academy of Sciences with attached up to 65 scientific institutes was formed during the Soviet period. At present all these institutes are under the umbrella of the Ministry of Education and Sciences of Georgia. They are amalgamated with different Tbilisi Universities. Although they are still accountable to the Academy.